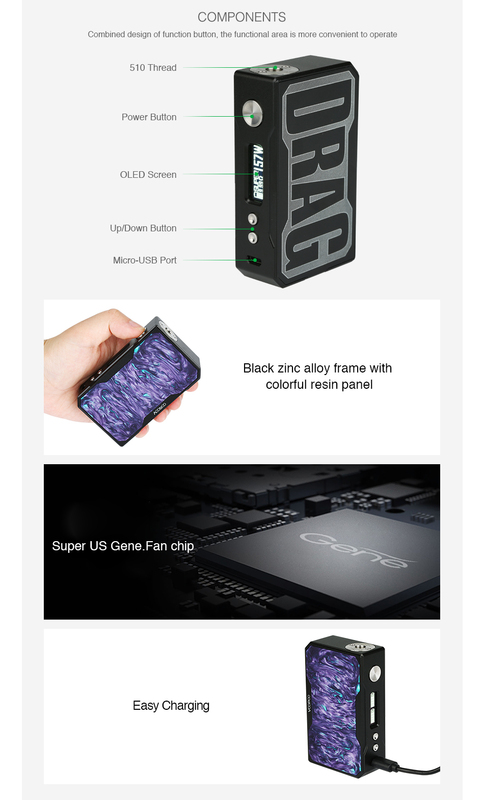 The VOOPOO Drag is powered by the 32-bit super US GENE.FAN chip, the DRAG can bring what you have always wanted - max 157W output power, powerful temperature control of Ni, Ti and SS coils, super mode and the fastest fire speed ever at 0.025s. You can always keep the mod up-to-date with upgradeable firmware too so you will never miss anything new. The resin style drag has its own unique pattern. We could not guarantee the product has the same pattern that is pictured. VooPoo Drag RESIN Mod First Impressions! My absolute favourite reg. mod. I'm not going to lie, I originally only wanted this mod because of the pattern (Turquoise). Now I use this almost exclusively! Easily runs all my tanks, from RDA's to MTL's like the nautilus mini. It fires FAST! One caveat, the wattage on screen always seems higher than it says, so start a little lower than you normally would on any other mod (example, 95W on this mod feels like 100-105W on other mods). Also, the menu can be a bit difficult due to all the different amounts of button presses. Other than those 2 points, this is perfect. Battery life is great, looks are on point, and even though it is boxy, it feels really good to hold. It will have slight overhang when using big tanks like 25mm (24mm RDA's sit almost perfectly flush with no overhang) But MTL tanks don't look weird and tiny on it so it's a great size. Overall I can't say enough good things about this. The best do it all, take anywhere mod in my opinion. Very accurate coil resistance detection so if your coil master isn't handy this is really good.